I love everything about Thanksgiving and especially I love the part about giving thanks! 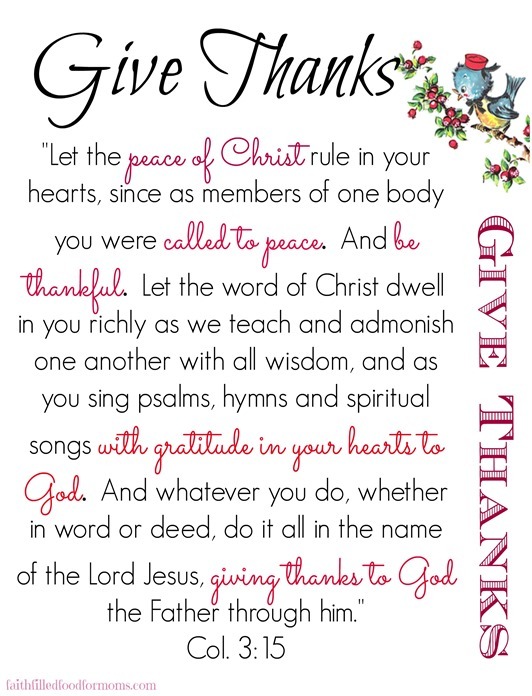 [clickToTweet tweet=”Cultivating a thankful heart is not a once a year project. It’s something we must really WORK at. Cultivating a thankful heart is not a once a year project. It is something that we must really WORK at all year long. It’s hard to be thankful sometimes because life can be hard. Jobs are lost, people get sick, kids drive us crazy…you know hard! We especially cannot teach our children the art of being thankful if we are complainers for 90 percent of the year and then sit at a beautiful table on Thanksgiving and go around the table and share what we are thankful for. Well actually some thanks is better than nothing right? Well maybe. A thankful heart comes from knowing that all things come from a Creator that cares and loves us deeply, that lavishes on us everything we NEED. Knowing in all circumstances that God is in charge and sees every little detail of our lives and is in total control. God is already in our tomorrows and so we need not worry, complain or fret. I realize this is totally easier said than done..It’s a heart habit that we must work at and cultivate. It’s a must! For today look around you and even if life seems like a mess, Give Thanks for one little thing…even if it’s the very breath you breathe. I know it’s hard..but we need to start somewhere. There was a time in my life that I was very ungrateful due to hardships that I had in my life..but when I really started seeking God, He gave me new eyes to see all the goodness and wonder around me. Print out the Scripture Printable and start practicing today. What is one tiny thing you are grateful for today? Today I choose to be grateful for the many blogs I receive so much inspiration from like yours. Blessings. Hi Laurie! You are sooo sweet. I love your blog too..so many beautiful pictures with so much inspiration! Hey I had emailed you to ask you about lighting and photography books..you may not have gotten it because I just sent a reply to your update. Have a blessed day and thanks for stopping by! Awww Aimee you are so sweet. I love the pretty and yummy but now and then we have to splash a little reality in there don’t we 🙂 Thank you so much for stopping by and many blessings to you! You are right and I’m very thankful that my family are safe and well. Awesome Pinkoddy! I’m thankful they are well also! Thanks for stopping by and blessings to you! I hope this answered your questions. If not let me know. Blessings. Oh thank you Laurie! Yes I love most all of my pics in natural light but since most of mine are cooking pics and I do a lot of dinners..now that daylight savings time is here I have no natural light at that time of day…do have suggestions for some lighting? And thank you for the link to your photography book post! Lovely. Thank you for linking to What’d You Do This Weekend. You make such beautiful thoughtful posters – I have used them throughout the year at work, and now will at home as I have retired – I thank you.